The natural turtles’ habitat is from tropical and subtropical coastal waters around the world. They are frequently found in Europe, North America, from Alaska to Chile. So they are named based on their frequent location. Siew Ann writes a blog for Singapore freelancers called lancerX. She notes my keen interest in turtles. Hence, she shared with me about her finding of endangered turtle species in Singapore. There are more than 100 hawksbill turtle eggs hatch in Sentosa fourth turtle hatching and almost 120 critically endangered turtles hatch at raffles lighthouse island news published at straits times. It is interesting to find such news. There is a couple of reason for them to migrate. Though we may not know the reason, let us welcome the turtles to Singapore. Why do the Chinese love turtles? It is the question I ask. During younger days, I often observe my relatives often decorated my grandparents’ birthday cake with turtles. Yes, they are slow by nature. However, their virtues are patience, perseverance, and hardworking. My friend mentions, “Turtle is a symbol of wisdom, endurance, wealth and longevity.” Something new to me. Currently, my children’s picture book is going to be launched. It is about the life of family turtles. 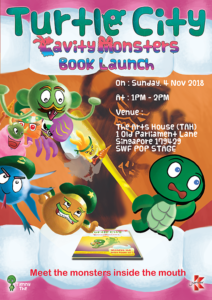 And the inaugural topic is on teeth hygiene titled ‘Cavity Monsters’. A family of Singaporean turtles. Please kindly register your attendance at www.turtlecity.com or you can come on the event itself.